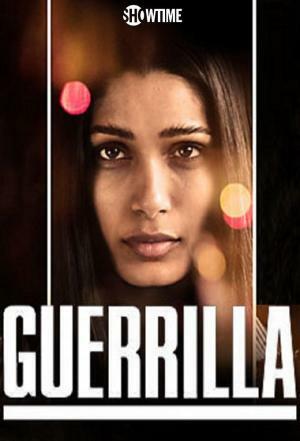 Guerrilla (2017) : Série TV de 1 saisons et 6 épisodes diffusée sur Showtime. Casting, acteurs, bandes annonces et actualités. L'histoire d'amour d'un couple engagé en politique dont la relation amoureuse et les valeurs sont remises en cause lorsqu'ils libèrent un prisonnier politique et forment une cellule underground dans le Londres des années 70 en plein "Black Power". Casting de la série "Guerrilla"
S01E01 Episode 1 13/04/2017 London, 1971. In an age of open racism, fervent nationalism and anti-establishment passion, two politically engaged and idealistic young lovers, Marcus Hill and Jas Mitra, fight back against the injustice and deep-rooted prejudice they face on a daily basis. But, unbeknownst to them, they are being targeted by Special Branch's Black Power Desk, led by police officer DCI Nicholas Pence and his deputy, Cullen. S01E02 Episode 2 20/04/2017 Marcus, Jas and Dhari are on the run, their faces plastered all over the news. Hot on their heels are Pence and Cullen, who harass Fallon and the black community, in a desperate attempt to locate the gang. Condemned by community activist Kent Fue, Marcus and Jas are forced to lay low in a safe house as Dhari and Leroy pursue a dangerous and controversial mission. Feeling marginalized, Jas brings London to a standstill when she does something unthinkable. S01E03 Episode 3 27/04/2017 The gang moves to a secret location in the countryside and starts training to be soldiers. But the strain of being on the run begins to take its toll on Jas and Marcus' relationship. At the country house, the gang meets Eliette, a French Canadian radical who inspires Jas. In London, meanwhile, Pence and Cullen are getting desperate: the gang are becoming notorious and there's a rival force trying to steal the case. Pence turns to Kenya for help. S01E04 Episode 4 04/05/2017 Kent begins to enjoy his role and forms a surprising alliance. Cullen and Fallon bond over a shared history Meanwhile, as Eliette and Jas speculate about the future, Dhari and Marcus put their personal issues aside - and the infighting that threatened to destroy the gang falls away as they come together to embark on a brutal mission. In a desperate attempt to save his relationship with Jas, Marcus decides to do something they will never come back from. S01E05 Episode 5 11/05/2017 In the wake of a tragic loss, Marcus and Jas' relationship is tested. Planning their final action, the gang reach out to someone from the black community that they initially spurned. In London, meanwhile, Kent's actions have a disastrous effect on the radical community, at a time when the Black Power Desk's reign of terror hits new heights - with Cullen now at the helm. Marginalized and overlooked, Pence begins to plan his escape. S01E06 Episode 6 16/05/2017 Infighting and external forces threaten to split the gang, throwing their final mission into jeopardy. Fallon colludes with the Black Power Desk, now being led by Cullen. Dhari and Marcus fight for the position of alpha male. Jas, determined, gathers materials for their ultimate action. Meanwhile, unbeknownst to Jas, Marcus receives news that threatens to destroy their relationship - and their final mission. Limited series finale. Envie de parler de Guerrilla ? Les discussions sont là pour vous. Retrouvez toutes les informations sur Guerrilla lancée en 2017 : synopsys, casting complet, acteurs, scénariste, réalisateur. Découvrez des séries similaires à regarder également. Faites vous une idée de la série grâce à la note des membres et aux critiques des internautes.